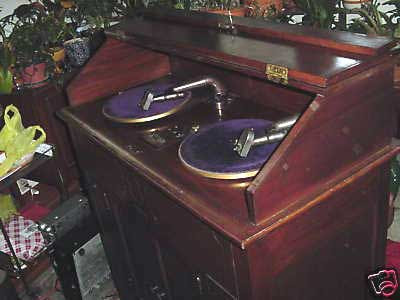 eBay item 220262676074 is a great looking pair of record players, apparently from a radio station. I'm not sure they'll fetch $2,200 + $250 shipping, but they'd make a handsome drinks cabinet. In Bill & Frank's essential book Last Night a DJ Saved My Life , there's a 1931 picture of Christoper Stone, Britain's first radio DJ, wearing black tie and leaning over a console a bit like this one. The purple velvet platters are classy. I see two turntables; where's the microphone? Slipmats not "platters." Ya know, for scratchin'. Suddenly I'm foreseeing a future in which there are actual wood-and-bronze DJ consoles - "Let's invite the Petersens over and have dinner and a mix party!" "What a lovely console you have Janet...are those Shure cartridges or Stantons?"